What to use for that basic drawing or sketch? Once we are ready to begin painting, the question arises: what do I use for that basic sketch or drawing? In this stage what you are looking for is a drawing tool, something that will leave fine marks. For me, what works best is fine charcoal or a pastel pencil. If what your are going to paint does not require too many pastel layers and you are worried about the dark color of charchoal and how it could end up being visible at the end, use a pastel pencil of a color that does not mess with your painting colors. For lack of a better name, "auxiliary sheet" works. For me, this is a must. it is nothing more than a piece of paper (preferably of the same kind i'm painting on at the moment) to try out colors before actually applying them to the painting. The picture above speaks for itself. This is super useful and i fully recommend it as a tool when painting. What’s in a pastel stick? Pastel artists typically paint with pastel bars and/or pastel pencils, and there is also a variance of pastel presentation offered by the trade name Pan Pastels, in which the pastel is compacted (similar to make-up powder) to be applied on paper with small sponges. My personal preference is the pastel stick or bar, and there are many different shapes and sizes out there, depending on the manufacturer. Pastel pencils are often used for fine details. 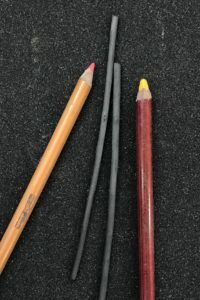 A dry pastels stick comes from a pulverized color pigment mixed with water and some binder (i.e. gum arabic or similar, in netural colors so that the color of the pigment is not affected). This mix forms a paste which is shaped into a stick, and it maintains what shape when it dries. Depending on how much binder is used, the pastel stick will be more or less porous. A lower amount of binder will produce more porosity and the outcome will be a softer pastel stick. Therefore, the harder sticks will be those with more binder in them, that is, those with less porosity. Harder pastels allow for more precise/fine lines. Soft pastels accomplish a more painterly effect. But in general with both types of pastels one can accomplish many different effects, it’s all in the technique. Some manufacturers add pumice or marble dust to the pastel mix to give the pastel stick a more abrasive texture, so that it adheres better to the paper. These pastels will feel more “sandy” when used. Others will feel more velvety to the touch. 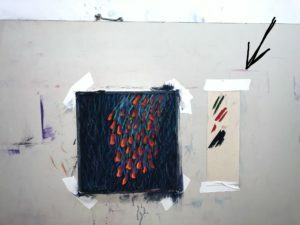 -Immediacy: The pastel stick is applied directly on paper. No need to prepare the color in any way. What you see is what you get. The color of the pastel stick is the color on paper. -Time savings: Pastels are a dry medium, therefore you paint in dry mode. No need to wait for the paint to dry when you finish. A second after the painting is done, you can begin to frame it. -Easy blending: Pastel colors do not “blend” as you would blend a liquid medium. But they can be blended directly on paper with interesting effects. -Dilutable in water or alcohol: Pastels are dry, but most professional-grade pastels dilute very well with water or alcohol applied with a brush over the pastel strokes made on paper. This is done for different purposes. I do it to produce an underpainting before I start applying color with the sticks, as I don’t like to paint directly over the raw color of the UART paper which is beige. I never use water, only alcohol because it dries faster. -Layers: You can work in lawyers with pastels. The more “tooth” in the paper you use, and depending on the type of pastel you have, the more layers it can take. -Spontaneity: Direct application of the pastel stick on the paper allows the pastel artist to paint faster and to be more spontaneous. -Variety of colors: In the present time many pastel manufacturers offer a large variety of pastel colors to choose from, and many will offer them in “open stock”, that is, for individual purchases (and not by pre-selected box assortments). -Highly luminous: Seen under the microscope, a stroke of pastel dust on paper looks like a mountain with many peaks and valleys (it’s not a flat surface). This quality makes light reflect in all directions and this gives pastel paintings a very special luminous quality. All these characteristics makes pastels a very versatile and interesting medium to paint with. Pastel paintings must be framed behind glass to be preserved. 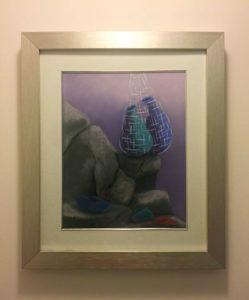 I would like to share two pieces of advice on this: First, find a “good” framer… and by “good” framer I mean a framer that knows his/her way around pastel paintings in particular. Someone with experience. It is very easy to damage a pastel painting if by mistake in the framing process the framer touches the surface of the painting. When you send your painting to the framer, you want it to come back nice and framed, no injuries. A framer that is familiar with pastels knows what he/she can and cannot do, and a professional work really shows. And the second advice on this point is: never, never, never frame with anti reflective glass with tints or treatments that cause them to have a degree of opacity. Some framers will offer glass that is totally transparent, or the alternative of anti reflective glass, which is also technically transparent but some brands make them in a way that they end up being a little opaque, which is what gives the glass the anti reflective quality. In this kind of glass, the colors of a pastel painting will not look as luminous or vivacious than with a glass that is totally crystal-clear. By definition, a pastel is bright and luminous… the anti reflective glass that has a degree of opacity kills these characteristics. Therefore, if you are going to consider framing with anti reflective glass, look for options that are truly crystral-clear; with no tints or treatments that produce any kind of opacity. What pastel brand to buy? 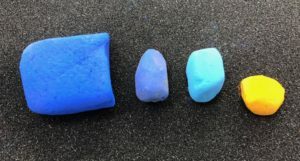 I should begin by clarifying that in this particular blog i will discuss only professional “dry” pastels (not oil pastels, not student-grade pastels). Ever since i started the path of pastels more than 10 years ago, i have been very serious about having an in depth knowledge of “all things pastel-related”, and if there is one thing to which i have dedicated significant time (and money!) is my pastels. When i started painting i realized there was a fair number of professional-quality pastel brands out there in the market (not in Panama, though, but in art stores in countries like the U.S.) I remember that i bought two or three brands first to try out, and i could see that each manufacturer produced a pastel stick with particular characteristics. The curiosity to know what other textures were out there made me want to try more brands, and one day i learned that some art stores offered sampler packs of pastel sticks, precisely to try out different brands. After trying many brands, i realized that there is no such thing as “the best brand” or “the brand that everyone is using”… Like many other things in the world of art, what pastel brand to use is a matter of strict personal preference, and in my case, it just so happened that I fell in love with various brands to the point that I’ve always worked with a palette of mixed brands in my studio. Until this day, i can say that i have used and know very well the textures and possibilities of all these brands: Sennelier, Unison, Terry Ludwig, Mount Vision, Gallery, Great American Artworks, Holbein, Caran D’Ache, Blockx, Jack Richeson, Diane Townsend, Schmincke, Blick, Faber-Castell, Rembrandt, Daler Rowney, Art Spectrum, Girault, and the ultra costly french pastels, Henri Roche (they say it’s the same pastels that Degas used). Each Roche stick costs US$20.00 delivered in Panama, compared to US$5.00, which is the cost of the most expensive pastel stick in the other brand group. You can tell Roche’s are very high quality pastels just by making a mark on paper with one of them, but the other brands hold their own quite well too. Of all the above mentioned brands, the ones that use most in my studio are Sennelier (french), Unison (english), Schmincke (german) and Great American (american). And I have been buying lately many reds from Mount Vision, they are gorgeous. In Mount Vision the relation size-price of the pastel stick is excellent, and they have become popular among many pastel artists for it. What differentiates pastel sticks when you compare brands to one another? First: texture. Some dry pastels may feel “sandy” when you make traces with them, while others may feel more “creamy” or “velvety” … And between these two ends, other intermediate textures can be found. Second: compaction. That is, softness or hardness. Schmincke pastels, for example, are the softest of the soft. They work great in final layers of the painting. I always say that when the tooth of the paper is full, it’s the time to bring a Schmincke. And it always gets the work done! In the opposite extreme there are the hard pastels like Holbein, Rembrandt or Faber-Castell (polychromos). And between these two extremes other intermediate degrees of hardness/softness appear. What pastel brand better fits a pastel artist depends on the style of the artist. That’s why i say it’s a matter of personal preference. For example, for me, it would be difficult to Paint with Holbeins, because their hardness do not go well with my personal painting style, but other pastel artists work perfectly with them. Third: size. Each manfacturer has its own standard size of pastel stick. Some are round, some are square, some are small and some are jumbo size. There are small square sticks like Holbeins; others are round but slim, like Girault; Unison has sticks that are somewhat wider than others; and Mount Vision sticks are the largest I have seen so far. Sennelier, for example, offers an extra large “jumbo” size in some colores and packs with “half-sticks”. I like in Townsend that they have an option of standard stick or larger rectangular sticks. I use the latter sometimes for backgrounds or large paintings. Fourth: color palette. Brands like Great American Artworks and Sennelier have a large color palette, while brands like Faber-Castell are more limited. My recommendation: Take your time to try different pastel brands to determine which one (o ones) better fit your personal painting style. If you use the right pastels “for you”, you will see the positive impact on the quality of your work, you will be able to paint with more confidence and you will feel comfortable when painting too. Happy to answer questions on materials through my email annette@abarcenas.net.